Larissa was the most important town of all the federated towns of the Thessalian plains; they were famous for their cattle and horses. Larissa was named after the daughter of Pelasgos and was situated on the river Peneios. 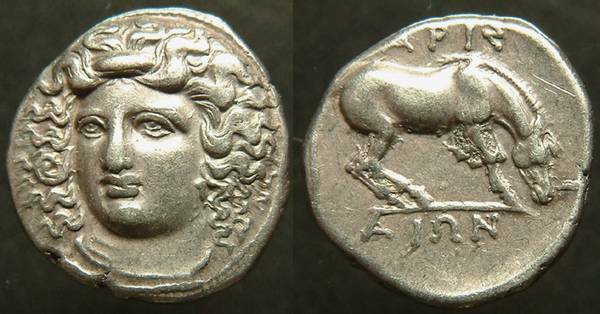 This stunningly beautiful coin depicts the nymph Larissa 3/4 face to l., wearing necklace; hair confined by fillet and floating loosely, w/ampyx in front. The reverse features a horse that is usually described as 'grazing' but everyone familiar with horses knows that this particular position, head down with the legs as shown, indicates a horse that is about to go down and roll over. These gorgeous coins are part of the attractive Greek series of 'facing' female portraits. This one is modeled after the very famous issues of Syracuse featuring the facing head of Arethusa by Cimon. C. 350 B.C. ; AR Drachm at 6.05 gm; ~ 19 mm.